In the past, I've never really enjoyed running. I was a soccer player in my youth. I loved that sport, but of course, there is a huge amount of running involved. When I was 13, living in the hills of Pullman, Washington, my coach told us, "We will never lose a game to another team because they are in better shape than us." This is a motto I use now with the teams I coach, and my pupils like it as much as I did. Coach would have us run grueling "lines" or "suicides" up and down the side of the Pullman hill our soccer field was cut into. I was burnt out on sprinting these hillsides and regretfully called that season my last. As I became a man, I found running to be an inexpensive form of exercise and from time to time would go through spurts of regular sneaker pounding, but preferred other forms of less shin-splinting workouts. The last few years of Nepal outreach has been a fantastic motivator for attempting to stay in shape year round. Climbing the mountains of the Himalayas requires extreme fitness and endurance. When I received our organization's training material, I was pleased to hear that running would not be the form or training to pursue, but rather practice treks, stair exercises at a stadium or on a machine, all with weighted packs. This is in addition to body weight squats, lunges and burpees. Imagine my surprise when I found that for the purpose of gauging a trekker's endurance, the training for our last January's trip required one to run a 10K! I was not familiar with marathon running, or how far a "K" was, but I knew it was probably going to require some grit on my part and even more importantly, a whole lot of grace on Christ's end. With my schedule and often having my four children in tow, I didn't have a lot of time to train, so I just went for it – pushing a jogging stroller with my two toddlers buckled in tight and my pair of dachshunds leashed near the left wheel. I wasn't sure how fast I was supposed to run the distance, but I was please I knocked out a 10K (6.4 miles) in 1 hour 14 minutes. When I cooled down and checked my email, I was horrified to see I needed to shave those 14 minutes off my time. Again, lacking much time to train for long distances, I tackled the full distance a few days later sans stroller, toddlers or dogs. Praying and leaning on the strength of Christ's might, knowing that the stamina needed wasn't for my own fitness purposes but for the glory of Jesus among the nations, I praised His power for helping me complete the task at hand in nearly one hour on the nose. Surprisingly, the week of muscle agony didn't deter me from wanting to ever run again, but rather fueled the desire to improve my trekking endurance in this manner. My friends at a Nepali Humanitarian organization, Mountain Child, contacted me a few months later, hoping I'd represent Oregon as part of their annual "Run4Hope" a 5K and 10K marathon taking place in order to raise funds and to bring awareness to their labor in the high places of the Himalayas. Since the training had shown me these distances were more than doable, I was happy to play my part, intending as a single runner to put Oregon on the "MC" map. Of course, the extrovert in me couldn't stay alone for long, and I soon opened the run up to our church, Calvary Chapel, and then to the Prineville community, especially the stellar athletes who are a part of P.O.R.K. (Prineville Oregon Running Klub). 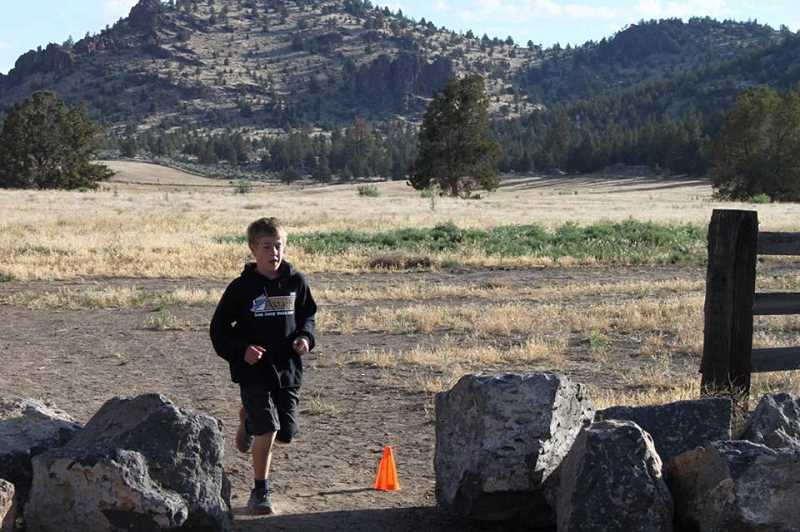 The run took place on June 16, and our route was a 5K starting at the new Barnes Butte trailhead, wrapping around the large meadowland and curving with the canal, finishing back at the trailhead with event coordinator Kimmy Cloud taking first place. The next 5K went through the Ironhorse and Ochoco Point neighborhoods, past the former hospital, down Oregon Avenue and along Seventh Street with a good final incline up toward Barnes Butte Elementary and back to the trailhead parking lot. This second 5K was mostly attended by the young fourth- and fifth-graders from Calvary Chapel, myself and my younger more athletic mini dog. My 11-year-old son Russell led the final mile by an impressive distance and took the 10K winner title home with him this year. I learned what a fantastic fundraiser and informing agent a marathon run can be and am happy to wear my Mountain Child 10k T-shirt to broadcast the work these folks are doing easing the harsh conditions of the beautiful people of the Nepali Himalayas. Mountain Child exists to carry hope to these many ethnic people groups in their five core areas of (1) fighting human trafficking, (2) medical (3) environment (4) education (5) child labor. I have seen firsthand their work in addressing and relieving the brutal conditions of the villagers and have a deep-seated love and support for their organization. I encourage you to check out their work at mountainchild.org and come out to run or support next year's Run4Hope. Rory Rodgers is the pastor at Calvary Chapel of Crook County. He can be reached at 541-416-9009.